To be very honest, I think this movie is overrated, yeah that’s right overrated. The only thing good in the movie are the visuals other than that, what’s there? The story??? Has anyone heard about Pocahontas? The ‘Navi’ look like overgrown Smurfs! To think that the guy who made ‘Terminator: Judgment Day’ made this movie brings a tear to my eye. Anyways, here’s the story. Humans go to the Planet Pandora to steal their natural resources. Unfortunately for them the forests of Pandora are too dangerous to explore so they create Avatars which resemble the natives (Na`vi) to do their dirty work. 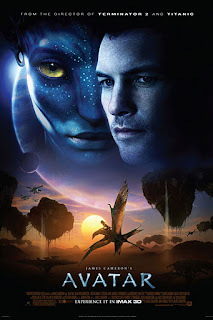 Jake Sully (Sam Worthington), a paraplegic former marine is called in to take the place of his deceased twin brother. Now Jake Sully goes into the Na’vi tribe and learns their ways. His intent is to find their weakness, try to destroy their home and steal their natural resources. But he soon learns that the Na`vi way of life is far better than the one he lived on planet earth. Now with a change of heart he tries to save the Na`vi and their way of life. Overall it is an average movie that you can watch once and put in the DVD player to shut the kids up. The fact that this movie is overhyped makes it an easy movie to hate. I mean, what is with all those aliens? Did the animator get tired and copy paste all of them? They all look identical! Don’t tell me there wasn’t a lazy fat Na`vi in the group. And what is with the forests? My God! So many colors. Maybe if I was stoned! I would have liked the colors. Sigh, I guess, I saw the movie with too much expectation. Like I said it's an average movie, with some good visuals.If you like seeing aliens that are so blue your eyes hurt, running around half naked in a glow in the dark jungle! watch this movie. Its worth for its $300 million budget.. 2500 VFX shots.. I feel that its the most technically advanced movie released so far. But I agree that every Navi looks alike.. Lol.. Exactly my poin... It's technically advanced but story point of view nothing great... Sum it all up and it's an average movie... That's it! It's not the greatest movie of the century... Or even the year. Movies like Star Wars, The Matrix and his own Terminator and Aliens are the movies that come to mind when I think about sci-fi... and these movies have left a standard and a movie like Avatar can never live up to it... I never said Avatar was an awful movie just that it's over hyped! It doesn't deserve the 2.7 billion that it received... if you ask me it was a perfectly targeted film to reap in revenue... plain and simple James Cameron sold out, he stopped making cult movie like terminator and gave into making crowd pleasing movies like Avatar. I don't think this was his dream... I think he just said that to sucker people in! Guess what? it worked. James wasted his 7 years just to make a cindrella story, lol.